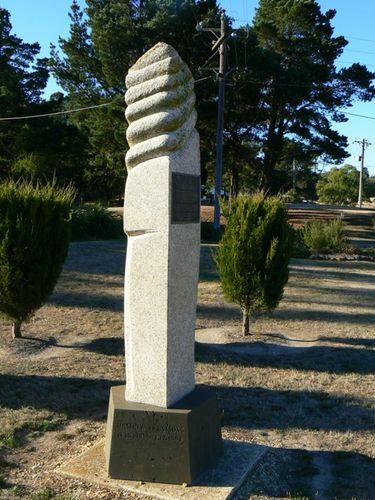 A monument commemorates the five Geelong West volunteers firefighters who lost their lives while protecting Linton from a bushfire in 1998. On 2 December 1998, a bushfire burned through private land and state forest near the township of Linton, Victoria. Fire fighters from Dept of Natural Resources and Country Fire Authority (CFA) were deployed to fight the fire. At approximately 20:45 hrs, two CFA tankers and their crews were trapped and engulfed in fire following an unexpected wind change. The crew of one of those trucks, five men from Geelong, all volunteers from the Geelong West Brigade were killed. THE FIRE STARTED AT SNAKE VALLEY ABOUT 1PM AND BY MID AFTERNOON THREATENED LINTON. THE GEELONG WEST CREW ATTENDED AS PART OF AN EMERGENCY STRIKE TEAM FROM THE GEELONG AREA. A MAJOR WIND CHANGE AT 8.45 CAUSED THE ENTRAPMENT OF THE GEELONG WEST CREW WHEN FIRE SUDDENLY ENGULFED THEIR TANKER. IN THEIR HONOUR A MONUMENT HAS ALSO BEEN PLACED IN THE NEARBY FOREST BY THE LOCAL COMMUNITIES.